There was one man, I could always notice, very distinctly, from the army of sadhus, and holy men, present in the starting of the Girivalam path . Not just now, but from the beginning, when I started doing circumbulation, around Arunachala. He had a saffron clod. He used to sit in one single place. Invariably, he could not go unnoticed by the devotees, who used to do girivalam regularly. Apart from that ,there was another distinct quality for which people always recognised him. 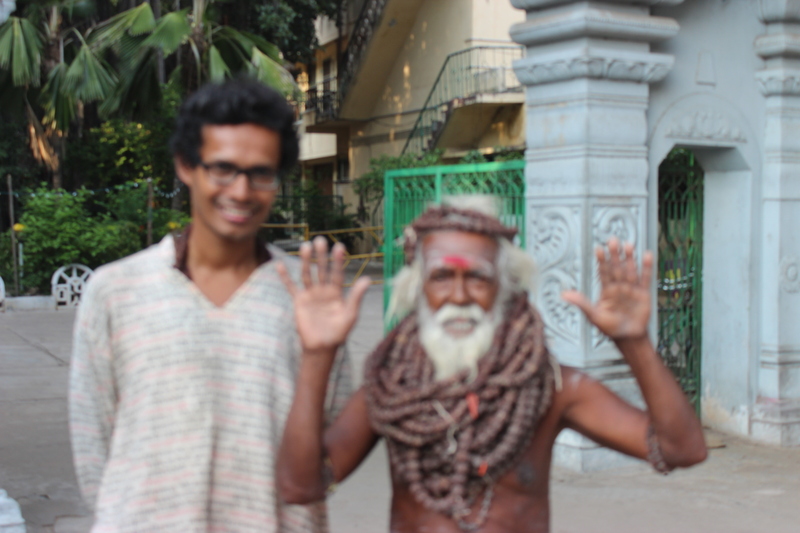 There was no other saffron clod sadhu, wearing so many rudraksha beads around his neck. Known as “Annamalai Swami” , in my earlier days , whenever I used to start my Girivalam, he would put both the hands up to bless me . This was the way also , I had found how the Swami and Sages of Tiruvannamalai blesses , in the similar fashion which we see in the picture, where they put both of hands above to indicate there blessing posture. There is something similar on the act and ritual of blessings of the Swamis and Sadhus of Arunachala and the philosophy of that blessings mentioned in Arunachala Mahatmaya where Arunachala himself instructs Gautama Maharishi, and blesses him with these words mentioned below.